All my Christian life I’ve heard the Church likened to a hospital, for all the hurt and broken Christians, who need time to recover from their wounds, sicknesses, abuse, depression, divorce or just plain stupidity. Jesus didn’t open a hospital. He ran a Fix-it Shop. A woman had an issue of blood; touched His garment and was healed. The blind man had clay put into his eye sockets; he could see. The lame man at the pool; and the one lowered through the roof; both walked away whole. Jesus Fixed people. He said we would and should do the same. 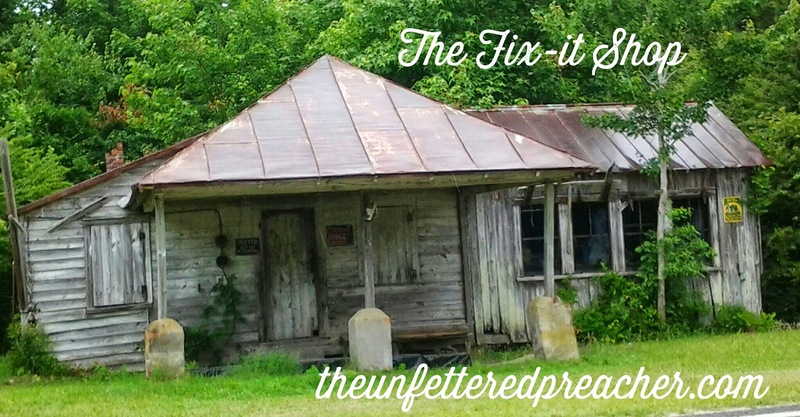 The Fix-it Shop posts, are going to dig into the miracles of the Bible, look at who God used to proform them and why. We will discover the difference between a man God uses mightily and the rest of us. Don’t be offended; My wife always reminds me, there was only one Moses and I’m no Moses. There is only one you. The only difference in Moses and you is he saw the burning bush and decided to check it out. God got his attention, he was humble, willing and obedient. Do you want to be used of God? God can and will use the one who sets his face like flint to seek the Lord. Is open to His direction, walks in the light he receives. The power of God has been promised us. The Gifts of the Spirit are available to us. He has left us the tools to build His Kingdom. We need to discover how to activate them in our lives.